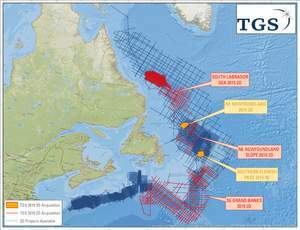 HOUSTON, TX--(Marketwired - Nov 12, 2015) - TGS is pleased to announce the completion of the fifth consecutive acquisition season offshore Newfoundland Labrador in partnership with PGS. The successful 2015 season was the biggest yet with the acquisition of over 27,000 km of 2D multi-client seismic data and two multi-client 3D surveys, both in excess of 4,000 km2. The joint venture library in this region is now approximately 112,000 km of modern, long offset, broadband 2D seismic data and 9,000 km2 of 3D seismic data in addition to 83,700 km of TGS vintage data, well log and interpretive packages. "In 2015, through the joint venture, we acquired more multi-client seismic data than we have ever previously achieved in a single season in this area. It was also our first multi-client 3D data over open acreage under the Scheduled Land Tenure System and our first multi-client 3D data over leased acreage to fulfill a work program obligation. The first Newfoundland Labrador Scheduled Land Tenure Call for Bids (NL15-01EN) closes today. Nalcor Energy recently revealed the results of its resource assessment in this area which showed the potential for up to 12 billion barrels of oil and 113 trillion cubic feet of gas in place. To complement this assessment, we are pleased to offer E&P companies a unique insight into the petroleum systems of the region. " commented Katja Akentieva, Senior VP Western Hemisphere for TGS.